For Olympic Sailors And Fishermen Alike, Rio's Dirty Bay Sets Off Alarms : Parallels Guanabara Bay will host the Olympic sailing competition in August. But it's so heavily polluted, it threatens the livelihoods of those who depend on its waters. 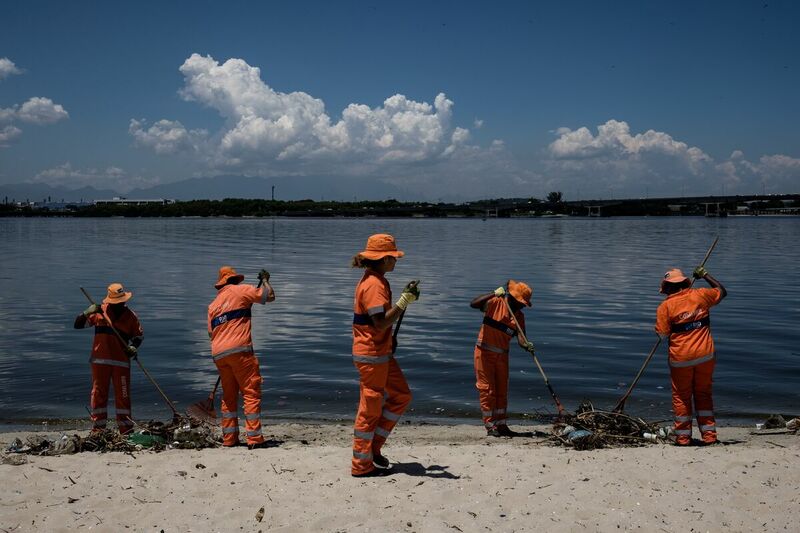 Cleaners in Rio de Janeiro collect debris from Guanabara Bay that washed up onto the beach last December. The bay, which will host sailing events at the Olympics in August, is heavily polluted. Guanabara Bay, where the Olympic sailing competition will be held this coming August, is a place of striking views — and filthy water that hides some nasty secrets. Many sailors have complained about the pollution and debris in the water where they will be racing. For Brazilians whose jobs depend on the bay, it's a long-term problem that's only getting worse. Alexandre Anderson, who heads the region's largest fishermen's association, took me out onto the water to show me the extent of Rio de Janeiro's water crisis. "There is the bay for the rich, for visitors to see, but there is also the bay of the fishermen, who are suffering. That is the bay of excrement, garbage and oil. It is the Guanabara Bay of violence," he says. That violence has cost some fishermen their lives. Back in 2009, attackers tied a member of the fishermen's association to his boat and riddled him with bullets. Other fishermen have disappeared. Anderson himself is a hunted man. He is under federal protection and lives in a secret location. Brazil is one of the most dangerous countries in the world to be an environmental defender — more have been killed here than almost anywhere on earth. "They shot at me in front of the fishermen's association, shrapnel hit my waist, but I knew that I should continue to fight," Anderson recounts. What he is fighting against is what is costing the fishermen their livelihood: pollution. Fish in the bay are dying off or are too full of chemicals and toxins for people to eat. There are many causes, including raw sewage and garbage dumped into the bay by communities that don't have access to sanitation infrastructure. But there's another culprit, according to Anderson — the oil and gas industry. While the world knows Rio for its famous beaches, it's also the center of the country's energy sector. Oil and gas accounted for 13 percent of Brazil's GDP in 2014 and the bay has become the hub for oil development projects, even though the actual wells are farther offshore in deeper waters. Petrobras, the state oil company at the center of a massive corruption scandal in Brazil, was responsible for oil spills on this bay in 2000 and 2015. 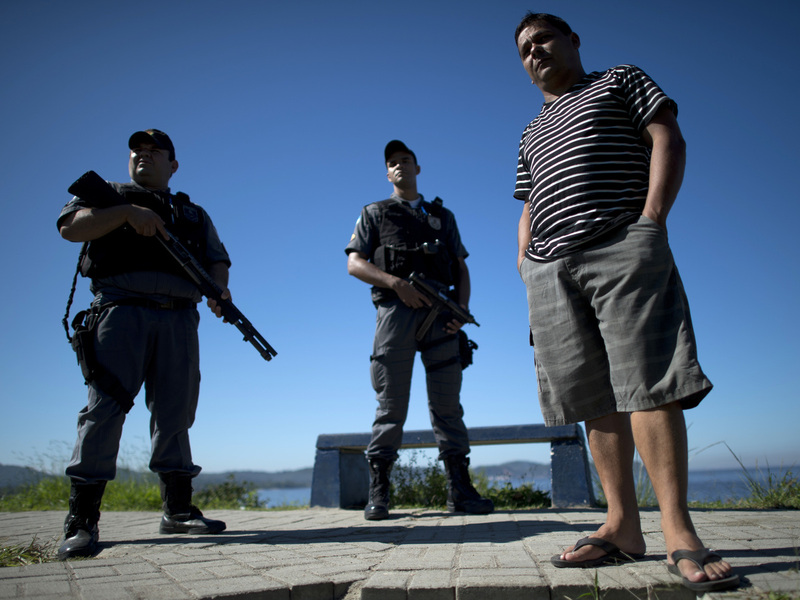 Alexandre Anderson, president of a fishermen's association, stands near Guanabara Bay, guarded by two policemen, in 2012. He is under federal protection for his role in supporting the fishermen. Fellow fishermen have been killed or have disappeared. He says they have been targeted for opposing industrial projects that pollute the bay. Anderson says the fishermen are under threat because they have challenged and stopped several oil and gas projects on the bay. He blames murky forces allied with the oil industry for the violence. We pull up to a large shipyard on the banks of the bay. Anderson points to eco-barriers that are meant to stop chemicals getting farther into the water. But many of them are broken and the water is a murky black. He dips his hands into the water and they come up stained. We then cross the water to the biggest refinery in the region, and there are broken barriers there, too. Oil pools around the base of mangroves. Anderson spends his days documenting these infractions. He says he is targeted because he is trying to protect this fragile ecosystem, while the authorities do little or nothing. "We fishermen understand that the Guanabara Bay has life yet," he says. "The Guanabara Bay is a nursery for many species. If only they would stop polluting and the government would start acting." As part of Rio's bid for the 2016 Summer Games, Brazil promised to clean up the bay. The fishermen had hoped the authorities would finally crack down on what was happening, but they say all they have now are broken promises. As the bay has become busier, the fishermen have seen the area in which they operate diminish. Petrobras has created exclusion zones around its infrastructure and federal prosecutors have had to repeatedly get involved. One of them is Lauro Coelho Jr., who told us there are ongoing investigations into multiple deaths and disappearances of fishermen since 2000. "The oil industry is involved in an environmental and economic conflict in which there is a clash between development and the environment," he told us. "And in the midst of this conflict, deaths occurred." But he said there is no evidence directly linking the murders and threats to any specific actor. "Petrobras is unaware of these incidents and rejects any act of violence against the fishermen. ... All of our projects rigorously follow the various government environmental controls and are licensed." In the statement, Petrobas adds that it supports both environmental and social projects in the area. But violence is not the only threat to the communities. Recent studies have shown the water in the bay carries harmful viruses and bacteria. Residents talk of illnesses and even deaths linked to the water quality. Scientists confirm that the pollution has affected the health of the communities that interact with the bay every day. In the fishing community of Surui, Yuri Chagas, 14, recounted how last year, he went swimming in these waters after he cut his foot. Suddenly, his foot began to swell, and he was hospitalized. "They almost had to amputate my leg, but later they decided it wouldn't be necessary," he said. "I've had to do physical therapy because I was walking with [a] crooked leg." Back on the bay, Anderson, of the fishermen's association, drives us back to shore as flocks of birds arc into the air at dusk. "We are the grandchildren and the great-grandchildren of traditional fishermen. Our forefathers for hundreds of years have fished here," he says. He promises he will continue the fight long after the Olympics have come and gone.